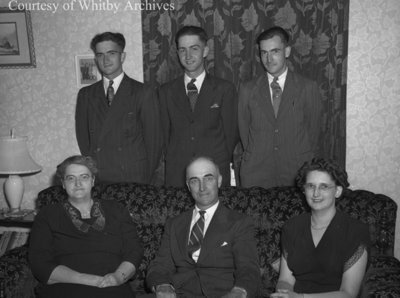 A black and white large format negative of the Powell family on 4 June 1948. This photograph was taken for the 35th wedding anniversary of Elmer and Adella. Powell 35th Wedding Anniversary, June 4, 1948, Marjorie Ruddy. Whitby Archives A2013_040_370.